WorkFit-T/TL Workstation— Top reasons you should choose WorkFit. Invigorate your work day with this ultra simple and flexible sit-stand desktop workstation. WorkFit-T and WorkFit-TL save space because they move up and down, always staying within the footprint of your desk. The platform is extremely stable throughout its range of motion. One can freely lean on it while working without worry about tip or height-drop. Click here for more information. 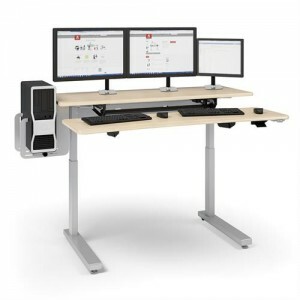 WorkFit-S/SR Transfer virtually any worksurface into a personalized, height-adjustable desk. WorkFit-S clamps to the front of a desktop surface. Keyboard, display(s) and integrated worksurface easily lift together with a single, fluid motion using patented Constant Force™ Lift technology. Click here for more information. WorkFit-SR Clamps to the rear of your worksurface and offers the same great stability and ergonomic features as our popular WorkFit-S, but clamps in the rear of your worksurface. Click here for more information. Sit-Stand Desks WorkFit and Elevate Improve energy and productivity with an ergonomic, sit-stand desk. All WorkFit Desks feature our patented Constant Force™ Lift technology for easy height adjustments. Click here for more information. WorkFit-LX/MX Monitor arm products. Lift and tilt one, two even three displays on a single base. With adjustable, height, tilt and pivot. Designed with Ergotron’s Constant Force™ Lift technology your display is effortlessly positioned with just a light touch. Click here for more information. 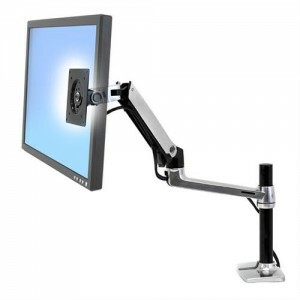 Neo-Flex Stands Easily and simultaneously lift LCD screens, laptops or tablets. 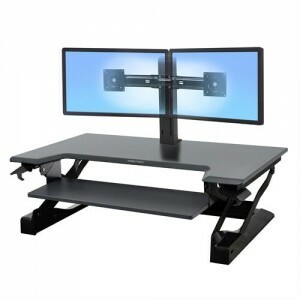 Adjustable display mounts help relieve the strain and fatigue commonly associated with extensive computing. Click here for more information. 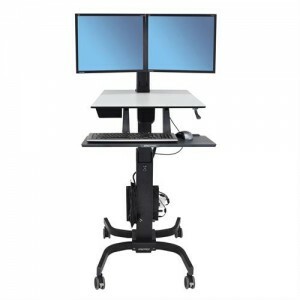 WorkFit-C, Dual Sit-Stand Workstation This innovative computer cart doubles as an adjustable standing desk platform. Stay energized and productive while you compute—move from a sitting to a standing position whenever you want. The large worksurface, back-tilt keyboard tray and independently adjustable dual-monitor stand make computing comfortable for prolonged periods. 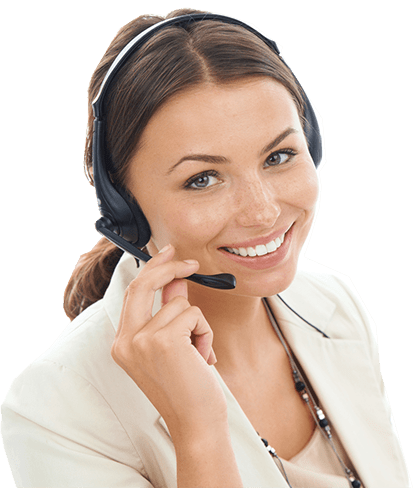 Click herefor more information. Call us 800-533-9949 for more information and prices or a full line Ergotron catalog. Ergotron carries professional-grade ceiling and wall display mounts, charging carts and cabinets for tablets, laptops and Chromebooks, mobile carts for education and healthcare. Your Workflow, Your Cart, Your Way!